Donald Trump’s campaign manager has been arrested and charged with battery for intentionally hurting a journalist at a Florida political event. 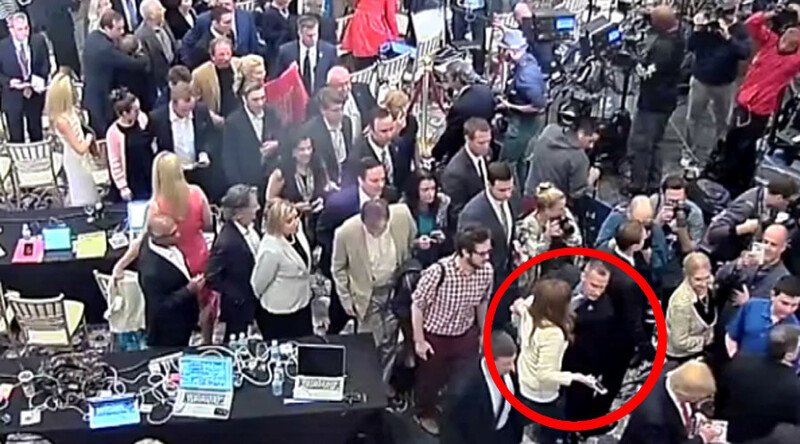 Corey Lewandowski grabbed the arm of Michelle Fields, a former Breitbart reporter, police records show. "Lewandowski grabbed [Michelle] Fields' left arm with his right hand causing her to turn and step back," the Jupiter Police Department report said. Fields showed police her left forearm which "appeared to show a grabbing-type injury," according to the investigating officer. Lewandowski turned himself in just after 8am Tuesday, the Palm Beach Post reported, citing the police report. Surveillance footage taken at the Trump National Golf Club and released by the police department corroborated Fields’ claim, the arrest report said. After the incident, Lewandowski had tweeted to Fields that she was “totally delusional” and that not only had he never touched her, he’d never even met her. "Mr. Lewandowski is absolutely innocent of this charge," Trump said. "He will enter a plea of not guilty and looks forward to his day in court. He is completely confident that he will be exonerated." It’s not the first time Trump has defended his campaign manager against Fields’ complaint. The incident occurred at a time when the real estate mogul was facing increasing scrutiny for violence at his campaign rallies. The incident also led to the resignations of both Fields and Breitbart News editor-at-large Ben Shapiro from the conservative website, accusing the outlet of being biased in favor of Trump. Two other reporters ‒ national security correspondent Jordan Schachtel and editor Jarrett Stepman ‒ followed them out the door the next day. Lewandowski is also accused of manhandling a protester at a different rally. “That was somebody else pulling him. I mean, I get ‒ I give him credit for having spirit. He wanted them to take down those horrible profanity-laced signs,” Trump told ABC’s George Stephanopoulos at the time.